The small town of Frisco located at the southern end of Hatteras Island, is a paradise for beach lovers who want to relax away from all the activity and noise of the mainland, and settle into coastal life. The town is small, and the northern end covers a wide section of Buxton and Frisco Woods, while the southern end is a thin stretch of Barrier Island where from a breezy deck, it's possible to enjoy an ocean sunrise and a sound sunset. With a few well-loved restaurants, convenience stores, and a variety of inviting yet secluded accommodations, Frisco may be the perfect destination for Outer Banks vacationers who want to leave all the clutter behind, and simply enjoy a vacation on the beach. Vacationers may worry that because of Frisco's relative obscurity there might not be many amenities readily available. However, Frisco is home to a number of restaurants, (including several that have been around for decades), a regionally-renowned tackle and convenience store, and easy access to two of the island's locally owned and operated grocery stores, located in Buxton and Hatteras. For accommodations, Frisco is home to two of the island's favorite campgrounds, one managed by the NPS, and the Frisco Woods campground. The NPS campground is located next to the airstrip and 4WD beach access, and offers incredible beach proximity as well as a wide public wooden beach ramp for easy strolls to the ocean. Frisco Woods Campground has been a star on the local campground scene for decades, featuring private wooded campsites, a community pool, incredible sound access, and an on-site camping supply store and gift shop, which is open seasonally. 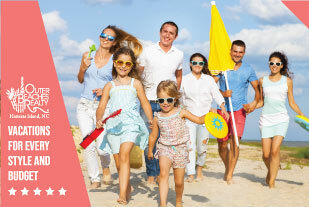 Families can also opt to stay in a local Frisco vacation rental home. The homes available for rent in Frisco range from coastal cottages with plenty of sea breezes and comfortable living space to all-inclusive retreats with the amenities of a five-star hotel. Several of these sand castles are even ideal for soundfront weddings, with plenty of private pool decking, multiple levels of decks, and extensive rec rooms to house the entire wedding party and reception. Despite the size, visitors can rest assured that there is a home to accommodate virtually every taste ad budget. Frisco Native American Museum - Open year-round, the museum features walls and walls of artifacts, ranging from the local Hatteras natives to the North Carolina Cherokees to national tribes from the East Coast to the Western US and beyond. Virtually every room and hallway is filled with treasures, and in April, the museum becomes the toast of Hatteras Island with an annual powwow, featuring guests, dancers, merchants, and historians from Native American tribes across the country. The museum also featured an eclectic and well-stocked gift shop, a birding room, and a nature trail that offers a slice of the local Frisco Woods habitat. Frisco Pier - Frisco visitors will also note the striking Frisco Pier jetting out into the Atlantic, which has unfortunately suffered repeated damage in a sequence of hurricanes, including Hurricane Earl in 2010 and Hurricane Irene in 2011. No plans are currently in place to rebuild and rejuvenate the pier. 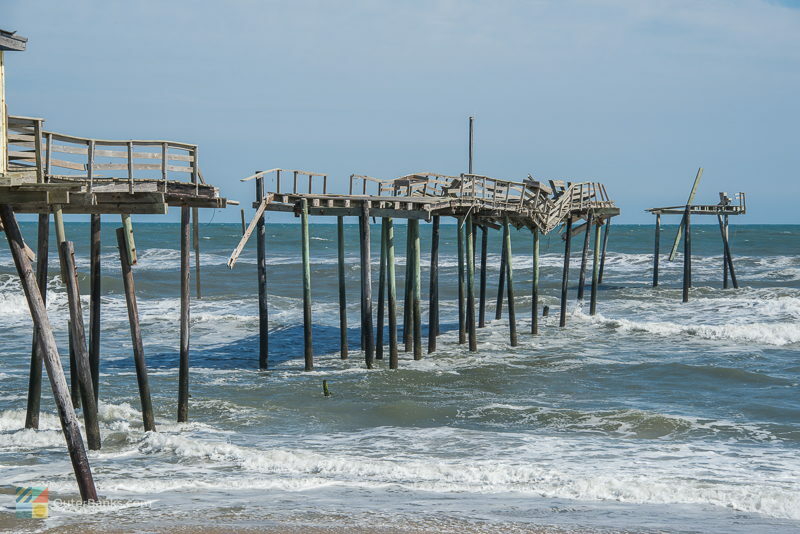 Vacationers can still marvel at the site and get an in-depth view of the fragile nature of the Outer Banks, particularly when it comes to major storms. 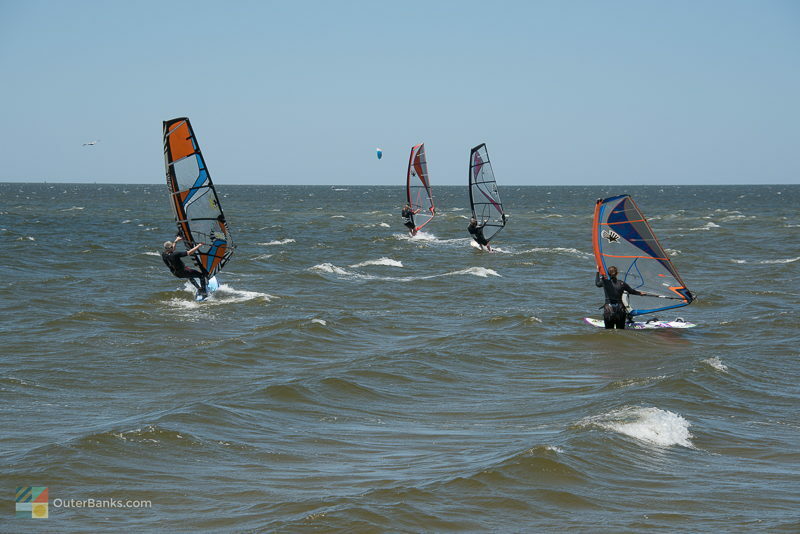 Kiteboarding and Windsurfing - On the soundside, kiteboarders and windsurfers will find miles of open water playground in the gentle Pamlico Sound, and the area has even spawned its own annual water sports celebration, "Wind Fest," which takes place at the Frisco Woods Campground. This event invites water sports lovers of all genres to come to Frisco and enjoy a long weekend of celebrating the sport, with full days of riding the wind and sound waters, followed by evenings filled with barbecues and camaraderie. 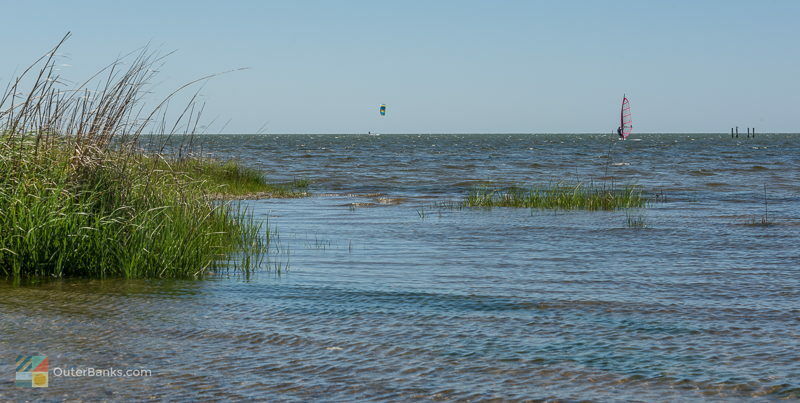 Kiteboarders and windsurfers will essentially love the exceptional sound access that Frisco has to offer, as well as the less populated and more hidden launching points, making it easy to enjoy a long plain of the Pamlico Sound all to themselves. 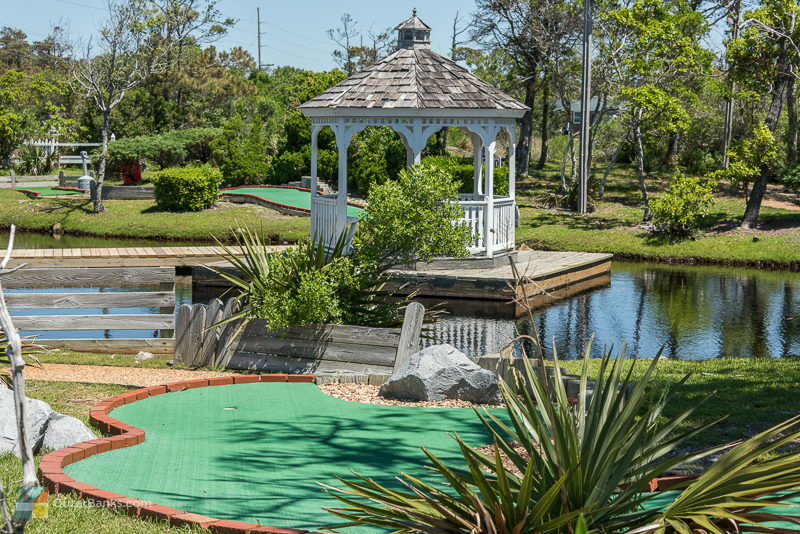 Amusements - Frisco is also home to the island's only go-kart track, which is adjacent to an exceptional woodsy 18-hole mini golf course, several art galleries, and Burrus' Flight Tours, which can give even the most seasoned Outer Banks vacationers an entirely new perspective of Hatteras Island. 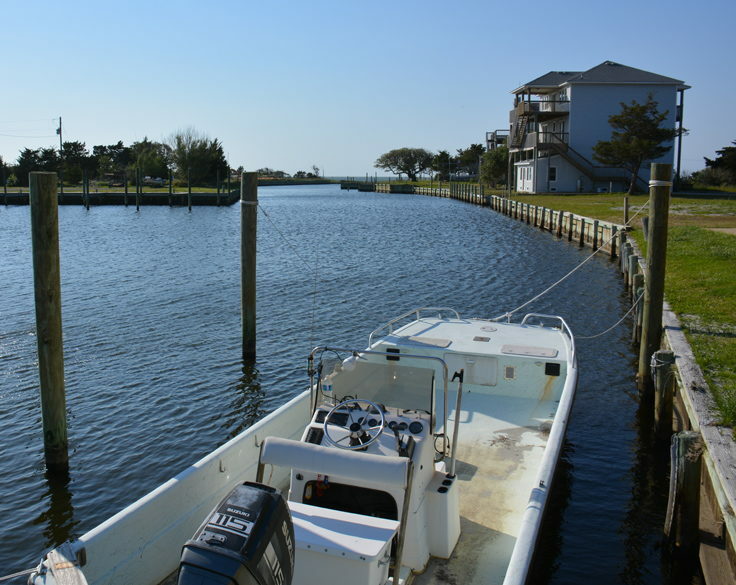 The tours generally last an hour or two, and can swoop visitors over Frisco Village and the southern beaches of Hatteras and Ocracoke, over the lighthouse and the northern Avon locales, or just provide an extensive scenic view of the greater Hatteras Island area. Available by advanced, pre-vacation reservations or by popping by the local stand next to Frisco Rod and Gun, Hatteras Island lovers should definitely look into taking an aerial tour for an entirely new way of admiring the landscape. Pets are allowed on a leash no longer than 6ft, year-round. Pets are prohibited on designated swimming beaches. Service animals are allowed at all times. Fireworks are not permitted in Frisco. Beach fire permits are required. Print, sign and keep your paper permit with you (permits available here). From May 1 to November 15, beach bonfires are only allowed at Coquina Beach, the villages of Rodanthe, Waves, Salvo, Avon, Buxton, Frisco and Hatteras, and the Ocracoke day use area. From November 16 - April 30, Beach fires are allowed throughout the park. Fires are allowed from 6am - 10pm. An adult must be present. Fires must be on greater than 3 feet in diameter. 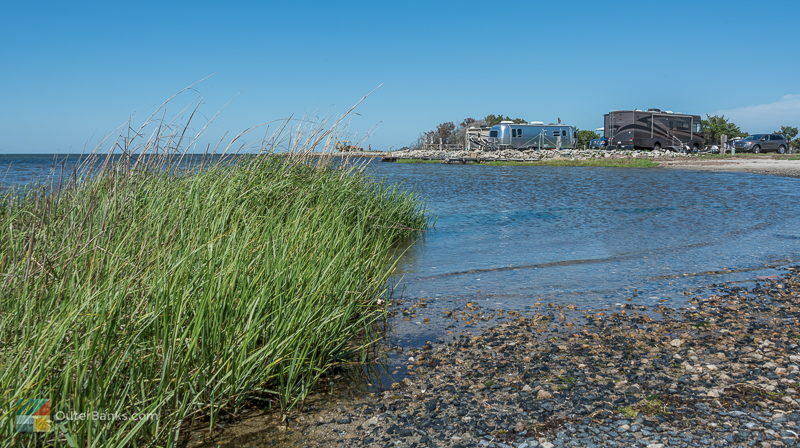 Fires must be built and maintained below the high-tide mark and 50 feet from any vegetation. Fires cannot be left unattended, and must be extinguished upon end of use. The area must be cleaned up. Metal detecting is NOT allowed within National Parks. There are no lifeguard stations in Frisco. 4x4 Driving on the Beach - Frisco also has one of the island's most popular beach driving access ramps, second only to Buxton's Cape Point ramp, located adjacent to the local Hatteras Island airstrip. This ramp is especially popular with anglers who find the fishing at Frisco simply fantastic, relaxing, and lots of fun. Bear in mind that the beaches in the town of Frisco are governed by the National Park Service (NPS), ergo a Beach Driving Permit is necessary to explore the shoreline by a pick-up or an SUV. The permit can be obtained with a visit to the neighboring NPS office in Buxton, and can be purchased on a weekly or annual basis. 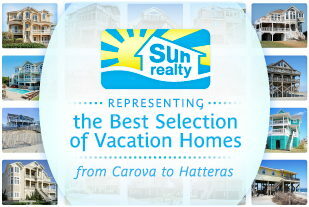 The beaches of Hatteras Island and Ocracoke Island are managed by the Cape Hatteras National Seashore. Permits are required, and can be purchased online and sent via mail, or in person at one of the following locations: Coquina Beach office, Cape Hatteras Light Station, and the Ocracoke Visitor Center. Each vehicle must have its own permit. Vehicles must be registered, licensed, insured, and have a current safety inspection if required in home state/country. Vehicles must have low-pressure tire gauge, shovel, jack and jack support board. A spare tire, first-aid kit, fire extinguisher, trash bags, flashlight and tow straps are recommended. ATV's are not permitted. Night driving is generally allowed from November 16 through April 30. See current access ramps and beach closings by visiting this page and clicking on the "daily beach access map". Obey all posted signs. Frisco is another Hatteras Island town that for centuries was inhabited by the Croatans, a branch of the Algonquins that settled on the island, and enjoyed a long and happy existence with no warring neighbors or conflict, and plenty of fresh off-the-coast seafood. In fact, recent excavations by local and visiting archeologists have uncovered massive shell piles, believed to be discarded oyster and clam shells from a rich and abundant shellfish diet. In recent years, archeologists have flocked to the Buxton and Frisco Woods areas of Hatteras Island for the incredible finds buried a few feet under the sandy surface. One of the most notable discoveries was by the late David S. Phelps of East Carolina University in Greenville, who in 1998, discovered a 16th century signet ring, made of gold, that was attributed to the English "Kendall" family. Upon further research, Phelps found that two men from the Kendall family may have been members of The Lost Colony, the famous Roanoke Island colony that completely disappeared in the late 16th Century, leaving behind the words "Cro" and "Croatan" carved into two trees at their original settlement site. Historians who deciphered that the tree carvings meant the colonists moved south to Hatteras Island took Phelp's discovery as a promising sign, and while the mystery is still unsolved, his find has prompted more historians to visit the excavation site, and create new local digging sites of their own. For a glimpse of the storied history of the Native Americans on both tiny Hatteras Island and from all over the United States, visitors are encouraged to stop by the Frisco Native American Museum. This locally run and operated museum has been a labor of love and a fixture on Hatteras Island for decades. After centuries of easy living enjoyed by the Native Americans, European settlers began to trickle in during the 1700s and 1800s, and eventually the town had garnered its own name, "Trent," or "Trent Woods." In 1898, the U.S. Post Office gave the village a new name, Frisco, and its own zip code, but frequent visitors find that many locals still refer to the area by its original European name, "Trent." Frisco was one of the last areas of the Outer Banks to be developed for tourism, and for decades remained a quiet residential community. However, visitors were gradually drawn to the area's seclusion, its miles of beaches, and its fantastic mix of maritime forest and beachscape, and eventually, tourism blossomed in the small town. Outer Banks vacationers in search of a beach vacation without all the traffic and distractions will adore a trip to Frisco. This small town at the southern end of Hatteras Island has just enough amenities for its loyal visitors, and miles of wide open beaches and sound sunsets, coupled with a small neighborhood feel. For an Outer Banks vacation that gets back to the basics of unspoiled beaches, local hospitality, and days of quiet relaxation, a trip to Frisco will definitely appease the most finicky of hard-core beachgoers. Frisco is located on the southern end of Hatteras Island. It shares a border with the town of Buxton to the north, and is located about three miles from Hatteras village to the south. How do you get to Frisco, NC? 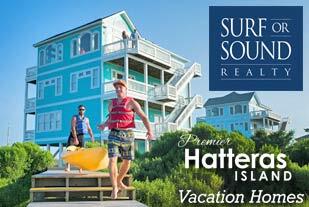 Visitors can head south on Highway 12 and cross the Bonner Bridge to access Hatteras Island. From there, Frisco, NC is located about 40 miles south of Oregon Inlet. What is there to do in Frisco, NC? Frisco is best known for its quiet beaches and miles of undeveloped beaches that are part of the Cape Hatteras National Seashore. The town is also the home of the Frisco Native American Museum, a popular horseback riding business, and a mini-golf course and go-kart track. In addition, Frisco features a small collection of art galleries and gift shops, home décor stores, bait and tackle stores, and a number of restaurants. What are the special events in Frisco? The Frisco Native American Museum hosts a wealth of programs during the summer months, as well as an annual Powwow which is traditionally held in April. For watersports fans, kiteboarding destinations like the Frisco Woods Campground may offer a number of seasonal watersports festivals and competitions, particularly in the spring and fall months. Local restaurants may also feature live music in the summertime, while shops and galleries may feature special art shows and / or Black Friday shopping events just after Thanksgiving. Where are the beach accesses in Frisco, NC? 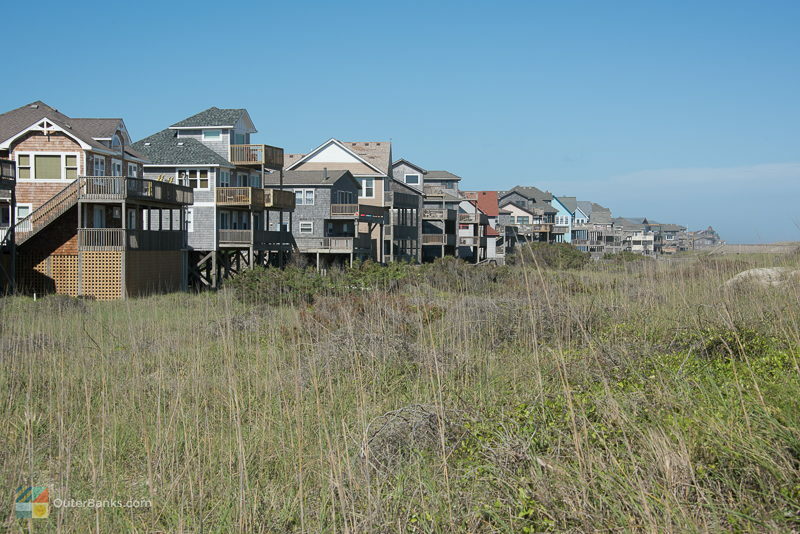 Because Frisco is part of the Cape Hatteras National Seashore, many oceanside streets in the southern part of the village have beach boardwalks that lead to the public shoreline. There is also an ORV ramp in the heart of town, Ramp 49, which leads to the undeveloped 4WD accessible shoreline. Frisco is also located just north of the “Bathhouse,” which is a public parking area and beach access that features seasonal restrooms and showers. Does it cost any money to park at the Frisco public beach accesses? All beaches within the Cape Hatteras National Seashore are free and open to the public, with the exception of sporadic and seasonal closures for bird or turtle nesting. It does cost money to obtain an ORV permit from the National Park Service to drive on the area beaches. Are there lifeguards in Frisco? There are no lifeguarded beaches in the town of Frisco. What are the attractions in Frisco, NC? Frisco’s top attractions are the Frisco Native American Museum, the Frisco mini-golf course and go-kart track, and the small airstrip that is open to the public. The town also borders the expansive Buxton Woods Coastal Reserve, which is one of the largest examples of maritime forest on the East Coast, and which has miles of nature trails through woods, marshes, and inland sand dunes. Are there shops and restaurants in Frisco, NC? Frisco has a number of shops and restaurants that include acclaimed local art galleries, unique vintage and thrift stores, home furnishing stores, bait and tackle stores, and gift shops. The area also has a nice handful of restaurants, and is close to a myriad of eateries in neighboring Buxton and Hatteras village. Where do you stay in Frisco, NC? 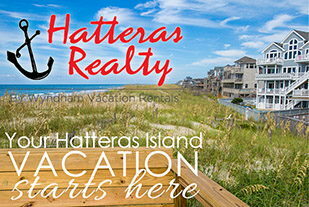 Most Frisco visitors stay in vacation rental homes, which can be rented on a weekly basis through Hatteras Island vacation rental companies. 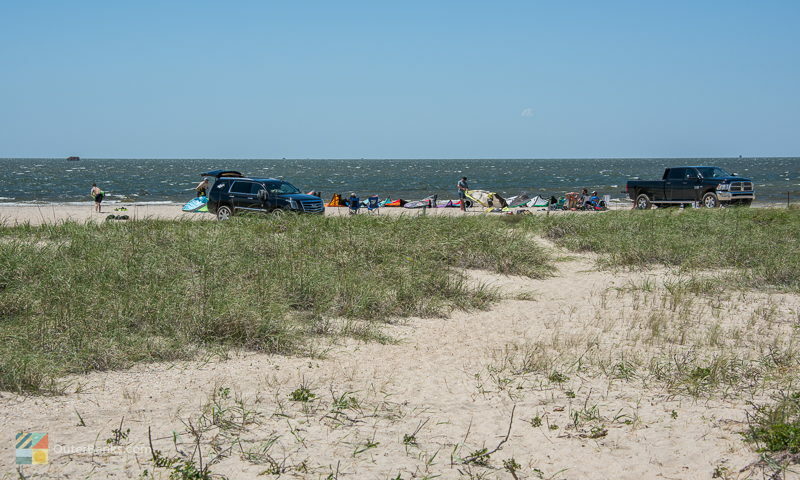 In addition, the town has several campgrounds near the Pamlico Sound and / or the ocean, which include the Frisco Woods Campground along the soundfront, and the Frisco Campground near the ocean which is managed by the National Park Service. What can you do on a rainy day in Frisco, NC? On a rainy day, visitors can easily explore the area museums, including the Graveyard of the Atlantic Museum in Hatteras village, the Frisco Native American Museum, and the Cape Hatteras Lighthouse museum and visitor’s center in Buxton. In addition, the town is less than 10 miles away from the Hatteras village ferry to Ocracoke, and is home to a number of art galleries, shops and restaurants. Are pets allowed on the beach in Frisco, NC? Pets are allowed on the beaches in and around Frisco, provided they are on a leash. Can I drive on the beach in Frisco, NC? Yes, with a permit. Frisco has an ORV ramp in the heart of town which connects with several miles of 4WD accessible beaches. A beach driving permit is required, and can be obtained through the National Park Service website, or in person at the local ranger station in neighboring Buxton. Are there shells in Frisco, NC? Because of Frisco’s shallow and gradually sloping beaches, the area is a fine place to find shells that have washed up intact. Visitors can head to the 4WD beaches via ramp 49, or go just south of town to the Bathhouse beach access to find miles of undeveloped shoreline to explore. Are beach bonfires allowed in Frisco? Beach bonfires are permitted on the local Frisco beaches. Visitors will want to pick up a permit from the National Park Service either online or in person at the Cape Hatteras Lighthouse ranger station. Where can you kiteboard and windsurf in Frisco? Frisco is a popular destination for kiteboarding, and there are a number of soundside vacation rental homes that are soundfront or canalfront for easy water access. In addition, soundside accommodation options like the Frisco Woods Campground may host seasonal windsports-based events, and have easy sound access. When is the best time to visit Frisco? Frisco is most popular in the summertime, when the beaches and air temperatures are at their warmest. 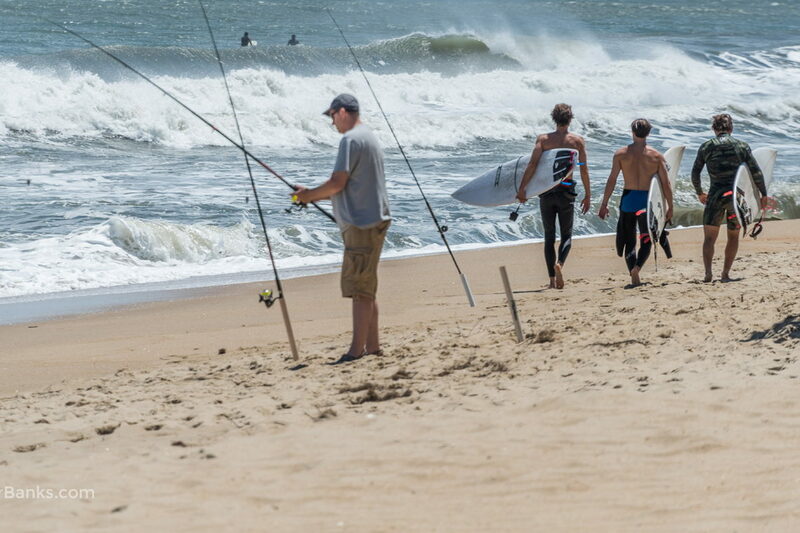 With that being said, the area is very popular with surf fishermen in the fall, and with kiteboarders and windsurfers in the spring and fall months when watersports conditions are optimal. What are the air temperatures each month in Frisco? 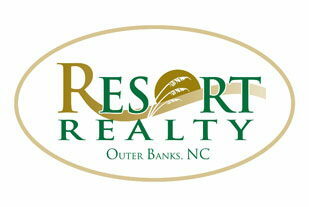 The reasons to build new on the Outer Banks are endless! The obvious reward is choosing the perfect home design for your family with selections that reflect your lifestyle, but the benefits go well beyond the "lipstick." There is tremendous peace of mind in knowing your personalized home has been built to the most stringent coastal building codes. The company is spearheaded by licensed North Carolina building contractor and real estate broker Ali Amini, who has been building custom designed homes on the Outer Banks since 2006. 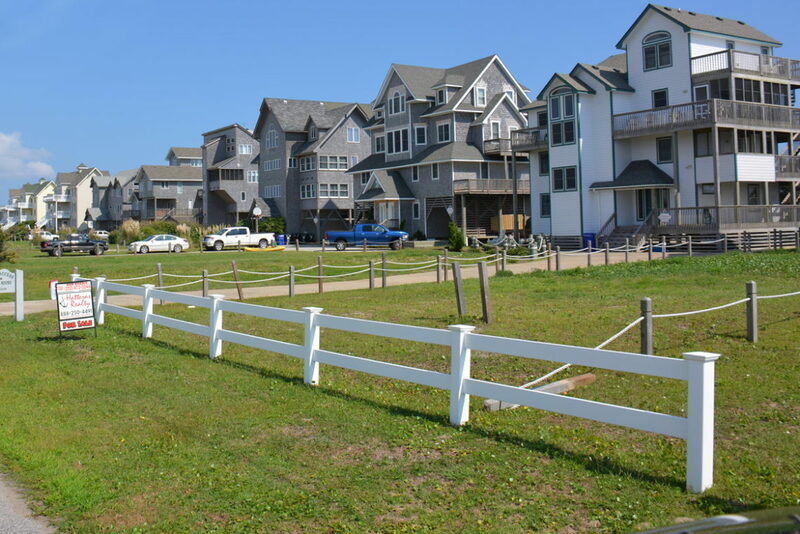 Since the company’s inception, Ali and his crew have managed the building of Outer Banks vacation rental homes, affordable housing and primary homes, townhome complexes, and a diverse variety of residences, which has totaled more than 150 different properties built. Ali and his team bring this deep expertise to every new project, as well as an understanding of what an owner envisions, to ensure that every potential dream home building project can turn into a stunning and a beautiful reality.